With just a day’s gap between the two ODIs in London, the drive from Kennington to St. John’s Wood have had the players reflecting over a result that is yet to witness a tilt in scales. In an awful collision between hope and reality, the Indians finally came through a game that witnessed their best chance to finally rope in a result to their favour. The Indian top order crumbled by the time ten overs were bowled in the day, with vice-captain Suresh Raina falling to a heinous shot which, given the situation, was way out of bounds. In an act that reacted to insistence on largely relevant public opinions, featuring MSD’s determination and Ravindra Jadeja’s place, the innings was laudably rebuilt on a weak foundation by the two. There are many who’ve voiced their mistrust over Jadeja’s place in the squad. For the youngster to respond the way he did speaks a lot on his temperament, a trait that is worth its weight in gold. Sure, there are a few glitches already in his relatively short career so far, but even the best sportsmen have had their share of mistakes committed when young. India, yet again, finds itself in a conspicuously difficult situation; even if it seems apparent that the previous ODI showcased their ability down the order. Ashwin, with his intelligent innings late in the game, surprised many with his cheeky approach. The Englishmen, on the other hand, just do not seem to run out of fuel. Bopara, a player who has been under the scanner since his return, steered England to victory. Munaf’s bowling, with an economy rate that would have sent a shiver down one’s spine had it been recorded on a Ritcher Scale, did no favours to an already depleted Indian morale. RP Singh, thankfully, looked a much quicker (and fitter) bowler than the one witnessed at The Oval a few weeks ago. But nothing seemed enough to stop the Kieswetter cannon ball from firing explosives to give England the start that they needed. A charge down the track against Praveen to heave the ball into the midwicket boundary was a shot that would have had the heads of NY Mets coaches turn towards the youngster. Bopara and Bresnan, towards the end, acted as able catalysts to help England add another win to their tally this series. As the game moves in to the Lord’s, it is only memories from the past that would shed any light into India’s hopes. England will look to play an unchanged squad, whereas the Indians, hopefully, might consider handing Varun Aaron his debut. That he might be raw and inexperienced doesn’t matter, his very inclusion could see an increase in the number of viewers who would turn on their TV sets on Sunday. This may tell us something about the state of Indian fans around the world: the romantics are a tiny minority, the ones with oil of vitriol up their opinion glasses are high in number, but there may not be enough to lend energy to effect a turnaround at Lord’s. Righteous contempt seems called for, but it is never within the Indian nature to do so. You just have to ask the cold-blooded criminals who’re yet to be tried by the government – they could narrate tales longer than Navjot Sidhu on how fortunate they are. If the Indians have to do something, they’ll have to do it without an iota of sympathy from the enraged fan. There is a growing sense that our best days as a Test Cricket Superpower are behind us, and that England, currently is in the driver’s seat to ride on this throne for the foreseeable future. A sense of anguish seems to dominate any conversation that runs around India’s future in Test Cricket – the consequence of a whitewash whose coffin was nailed at The Oval. There is, of course, some truth to this concern. Even Real Madrid’s 5-0 loss to Barcelona last December wouldn’t have had enough quantity of remorse to outweigh that suffered by the Indians lately. If at all anything was common, it was that both the Los Galacticos and Indians succumbed to the presence of sheer class amongst their opponents, coupled with bad errors of judgment intrinsically. England dominated the series with the aura of a historical superpower that has never been colonized. The script of the fourth test could’ve well been written before the first ball was bowled at the Kia Oval, but what was heartening to see from the Indians, for a change, was resistance of some sort. Dravid’s defiance had thrown seeds of hope in to the Indian dressing room, two of which managed to last through a session without having its wicket thrown away. Tendulkar’s near-repeat of his World Cup Semi Final innings against Pakistan, one filled with numerous chances that the opposition failed to grasp hold of, and Mishra’s battling (and splendid) innings – one that had to have had the other ‘batsmen’ hang their heads in shame- saw India through their first session without losing a wicket. Mishra’s guts, and temperament, are now widely endorsed with a large section of the Indian public willing to forgive him for lack of ideas while bowling – only to tout him to contention for the number six slot as a batsman. That it had to end this way for the Indians was a certainty. A curious selection towards the end of the series had depicted a thought, or even a belief, that the Indians were as adept in conference rooms, where selections were made, as their players had been on the green wickets of England. Indeed, the uncontrolled fall of morale, confidence and the exposure of weaknesses and inability overshadowed all imaginable pretenses – not least helped by the fall of seven wickets for a paltry twenty odd runs to bring this series to a close. Some of India’s most exciting one-day players were victims of the English soil’s greenish vengeance. Less gullible but no less feeble were the bowlers who ran out of ideas at the rate at which gas-guzzling SUVs drink fuel. Predictable responses to events of such drastic inconvenience hovered around packed calendars and lack of preparation – but lack of application, barring Rahul Dravid, stood out among the key culprits. England played brilliantly well, no doubt, but was made to look even better by the hapless Indians at various instances during this series. England’s progressive rise in performance of their players, with Swann completing the cycle with his dominant performance in the second innings of the final test, picking up six, pretty much summarizes their state of confidence. A few of the statistics from the recent past – backed by innings victories and large integers – plant a scary proposition to the rest of the world: they’re right on top, and there seems to be no roads that descend anywhere near the British Isles. Broad’s consistent lengths throughout the series, ones that would have made even the best of the long-jumpers proud, and high scoring cameos with the bat earned him the Man of the Series award, one for which there existed many a contestant from the English dressing room. Dravid, from the other dressing room, was parsecs ahead of any other Indian in terms of achievements this series. That, in itself, is a reflection of how the series eventually panned out. Most of the Indian players, subsequently, will have to bite the bullets once the post-mortem verdicts are out; not that most of these facts aren’t known anyway. Some of their ‘shorter-format’ skill sets have probed in and out like Somalian pirates in the Gulf of Aden. Apart from the self-inflicting damage that it has caused to most of them, more than anything else, it has left a billion sullen faces staring at this plight back home. On the contrary, the Englishmen have found themselves a bed of roses to recline on – their tale to reach the top of the rankings, followed by a whitewash of the previously reigning champions, couldn’t have had a better script in the making. The quality of their quests henceforth will decide whether they build their fortresses across the globe in sand or stone. They have had a remarkable time stamping their intentions, but the real game of governing unconquered territories is about to begin this winter. India’s performance this series seems like a hangover from the past with no present meaning. The standards displayed on the field continue to slip the limits of cricketing propriety, and it has become clear that something fundamental is amiss. It is understandably human tendency to stretch the truth when times are good, and hide behind it when riding through the doldrums. This Indian campaign has left public opinions on Indian cricket with a disdainful taste, none as disparagingly passive as the display on the 3rd day of the Oval test. There exists no strategy that can camouflage the current levels of incompetence on English soil, and as Australian cricket witnessed very recently, certain facets of Indian cricket could well be in for a major overhaul. At the same time, there is every fear that the administrators would respond to all this criticism with diplomatically phrased brush-offs. Part of the problem lies with the board and the selection. The recall of RP Singh, a topic of heated debate amongst many already, tagged the selection committee with the dubious hint of a “George W Bush” about it. RP Singh, in hindsight, would have preferred to have continued his vacation along the sunny beaches of Miami, than enter the contrastingly cold grounds of England after 8 months of first-class inaction to face the current World Number One. But that doesn’t pain the entire picture. The Indians, undoubtedly, on their day, can be incomparably strong opponents. Adding to that the monetary background of the players and the board, they may quite not appear to be a benign superpower. What was lost, amidst all this power and glory, was responsibility – a residue of which became the status that demoted us from champions to mortals. Whereas, on the other side of the river that separates the Champions from the Mortals, England continued their dominance and aggression with Ian Bell’s maiden double hundred. To borrow the words of Norman Maclean “… all good things-trout as well as eternal salvation comes by grace, and grace comes by art, and art does not come easy …”: Bell epitomizes the art of batsmanship, with grace and fluidity being apt by products of his wonderful technique. Rahul Dravid, the other proprietor of this gift continues to be the only Indian player who can walk with his head above the surface of the water in the Ocean of Misery. He continued to battle at The Oval, the same way that he has done throughout this series. If Dravid’s success can emphasize on the work ethic, technique and commitment that any youngster should possess to reach the top, and sustain at the top, Indian cricket should frame a completely different approach to nurture young talent henceforth. A follow-on is starkly consequential, with bad weather the only factor that can have an influence on the game’s scales titling towards a draw. With Swann back amongst the wickets, England will look to close the game out before weather can spoil their chances of a whitewash. The Indian fan should learn to tolerate a unit that isn’t quite as world-class as he’s always imagined it to be. The signs presently look as blank as Sreesanth’s expression on getting Anderson’s wicket yesterday. It will be very interesting to see if the BCCI, an organization that has pretty much gotten its way at every turn, will be able to accept and react accordingly to this. The only sign of aggression from the Indian bowlers on a rain-marred day, which lasted until lunch, was the quick bouncer from Ishant Sharma that took a piece of Strauss’ helmet on its way. Humbly reluctant as I am to obtrude the lack of venom in the Indian pace attack, as I’ve already done during the most part of this series, signs of amelioration were hardly visible. There was more crowd movement behind the side screen at the start of the day than the movement extracted by the Indian seamers using the new ball. Trapped in these webs of clueless lines and length was India’s newest addition RP Singh, who hasn’t played a test in a while. Like Praveen, his lack of pace does him no good but unlike the former, he didn’t appear intelligent enough. He had a great series in England back in 2007, and his Harmison-esque start to this test made one wonder whether he’s played any cricket at all during those four years. Cook and Strauss continued to grind the runs until the rain gods opened up to play spoilsport on an overcast day, conditions under which the Indian bowlers failed to shine. Barring the bouncer from Ishant, the Englishmen weren’t troubled as they continued to do what they did all series. And James Anderson, who was declared fit prior to the start of the game, will have more time to rest and have a go at the Indians – something that isn’t likely to happen before the 3rd day. 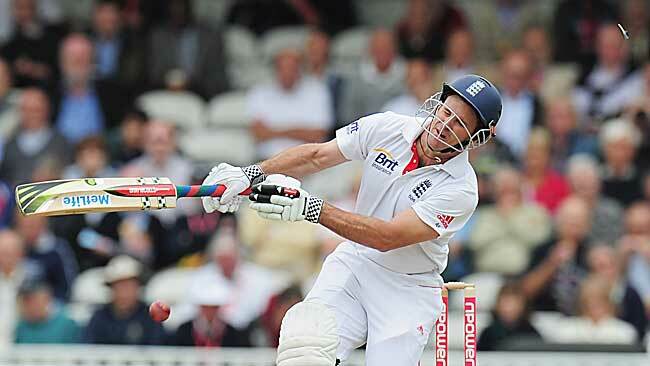 At 75-0, England will continue to pile on the runs, hopefully at a decent rate to annul the lost time on Day One. For India, a colossal change in approach, and performance, is needed.